WINDMILLS WERE A THING fascination, especially in the farmland of picturesque Europe, more so perhaps because they spoke of a bygone era that I felt I just missed. To much delight, the winds continued to blow in their directions, as it were, and the windmills kept going around. With time, however, as the water-table got deeper and deeper, the Netherlanders found other ways and means to keep them spinning, namely, Electricity generated by turbines spinning by the winds. And I would say, this is a niche electro-mechanical engineering field - building a very energy efficient and 'light' turbine, such that the winds can spin at, and at the same time it gives sufficient torque to the dynamo to create electromagnetic charge that could be refined as usable domestic electricity. And along with all that technical things, the ROI turns profitable within reasonable metrics (and also, that we don't end up having a dog catching its own tail). Now, so far there was no direct conflict of interest, if you like, between oil-burning (read: automobiles) energy devices verses electricity generation using water-spun, coal burning or nuclear turbines. And while saying that, I am choosing to ignore that portion of energy consumption where European and American homes prefer to use gas instead of electricity for domestic heating in the winter. I appreciate that this percentage might be big enough to ignore, but let's keep it simple here for the sake of argument. As Al Gore would love to tell you in a dark room with a huge LCD projector - both of these 'consume' natural resources, which are not renewable. And (to some degree) he is right. Unfortunately, the Earth could host only as many dinosaurs as few million years ago to turn them in oil today that could go on and on. The interesting part begins when the ROI (return on investment: time to turn profitable) for the oil companies starts stretching with every oil well getting deeper, water-source running dry, coal-mines hitting hard-rocks, and atomic energy falling hostage to missile-making men. 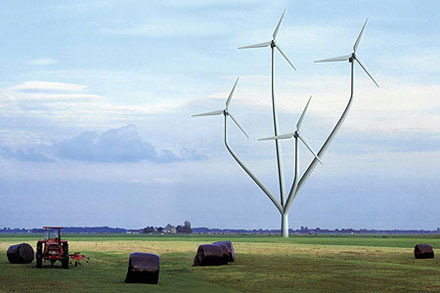 For them, 'going green' proposes the logical next 'green field'. The news as it is reported by Reuters today says that Mr. T. Boone Pickens, the legendary Texas Oil Billionaire it 'going green'. The Oil-man has plans to pump in USD 10bn into Wind-energy, and the proposal, which would start acquiring land next month, is to create the world's biggest wind farm. The estimates have it that when those 2,700 wind turbines would eventually generate 4,000 megawatts of electricity - the equivalent of building two commercial scale nuclear power plants - enough power for about 1 million homes. Mr. Pickens would also want to take the 'pressure off' the automobile sector by freeing up gas by not using it for energy production, but to let it go to those (billion dollar) refineries to pump out gasoline and diesel for the cars. At the same time, also take the pressure off from the American auto manufacturers to be energy efficient (and shake Toyota and Honda off?). I have come to admire the old Oil-man, not simply for him shrewdly planning for another 'windfall' (no pun intended) of billions, but also contributing to the geographical landscape of North America: Windmills look pretty... Anywhere. Related post: Who Pockets The Money You Pay Extra For Gas?